Freeze All Motor Functions, a Westworld podcast hosted by our own Ross Bolen and noted Littlefinger enthusiast Jared Borislow launches Monday, February 5. We'll be releasing a podcast for every episode of Westworld season one, spoiler free, in preparation for Westworld season two which has been confirmed for an April release. If you're looking for a way to kill time until the final season of Game of Thrones, aside from participating in the Night's Rewatch, this is it. If you didn't watch Westworld season one when it was released, it doesn't matter -- hop on board the train with us now. Subscribe to Grandex Labs on iTunes to get the first episode of Freeze All Motor Functions immediately upon release, and be sure to watch Westworld season one, episode one before Monday, February 5 to prepare for the first podcast. Follow along on Twitter @FreezeAllMotor and Instagram @FreezeAllMotorFunctions for updates and never-ending Westworld entertainment. We recap the 2016 Emmys where Game of Thrones became the winningest primetime series in television history, and break down some season 7 rumors. We recap and evaluate season 6 as a whole, go over the major Emmy nominations Game of Thrones received, and talk about how to deal with the off-season between now and Summer 2017. In a continued effort to digest the glory of season 6, our hosts read listener emails and discuss what to do with the podcast during the off-season. We break down the unbelievably thrilling season finale, "The Winds of Winter," while simultaneously trying to emotionally recover from how awesome the episode was. When does next season start? Send your thoughts, theories and predictions to ClamsAndCockles@gmail.com, or tweet us @ClamsAndCockles, because we'll be doing another listener email episode this week. In addition to that listener email episode, we'll be doing a season recap episode, because we can't stop talking about how season six was the greatest thing that has ever happened ever. Our hosts read and respond to listener emails regarding "The Battle of the Bastards" and predictions on what will go down during Sunday's much-anticipated finale. Our hosts relive the emotional roller coaster that was "Battle of the Bastards" and discuss potential plot points for the Season 6 season finale with returning guests Joe Nullet and Kelsey Heineman. Ross Bolen, Veronica Ruckh and Barrett Dudley read and respond to listener emails and talk more about what they think will happen in Sunday's episode. Our hosts break down "No One," talk theories, discuss listener emails, and make predictions with returning guest and noted Ramsay Bolton fan Dan Regester. Ross Bolen, Barrett Dudley and Veronica Ruckh dedicate this entire episode to reading emails from listeners regarding theories and predictions. Our hosts and their guest, Grandex intern Emily Clow, tackle "The Broken Man," get into theories, break down the preview for next week's episode, and respond to listener emails. Our hosts and their guest, David Ruff of PostGradProblems.com, run through "Blood of my Blood," discuss theories, make predictions about where the story goes from here, and get to some listener emails. On this week's episode of Oysters, Clams & Cockles, our hosts and their guest, comedian and writer Jake Goldman, dissect "The Door" (easily one of the most brutal episodes ever), respond to listener emails, and discuss where they think the story goes from here. 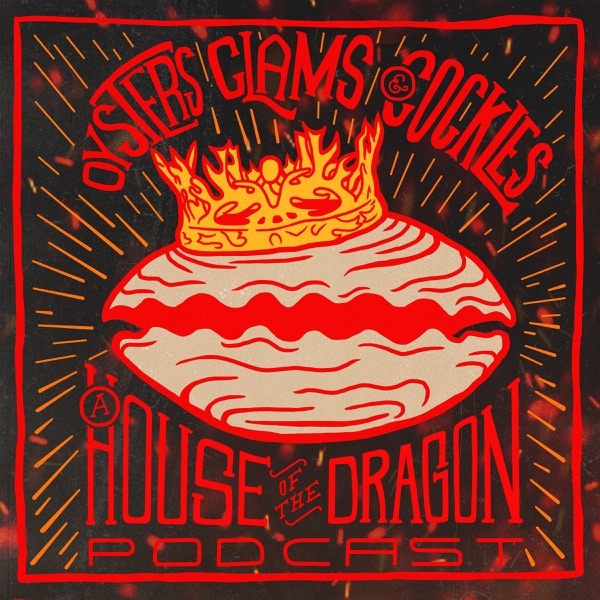 On this week's episode of Oysters, Clams & Cockles, our hosts and their guest break down the most uplifting episode maybe in the history of Game of Thrones. Three sets of brothers and sisters are reunited, Daenerys pulls off one seriously hot power move, and important chess pieces are moved all over the board. Joe Nullet returns as a guest host, filling in for Barrett Dudley who is overseas. Dan Regester brings us his notoriously smoldering hot takes as this week's highly disturbed guest. Relive a fast-moving episode three with our hosts and their special guest, John Naffziger, as they talk Jon, Bran, Dany, Tyrion, Arya and more. Our hosts recap and analyze the insanity that was episode two with special guest Kelsey Heineman, and theorize on what the future holds for everyone's favorite characters. Welcome to Oysters, Clams & Cockles - A Game of Thrones podcast for people who party like Tyrion and slay like Daenerys. In our first episode, we meet our hosts and their guest, Joe Nullet, before discussing the outstanding premiere of Season 6.